There are countless platforms and applications to power interactions with your customers. From personalised videos to cloud call centre software, chat, mobile apps, and customer feedback systems…the list of products and services is endless, and the biggest challenge is the time it takes to research all the offerings in the market. Fortunately, there's now a smarter, faster way to source technology. Simply enter your needs through our quick questionnaire and we’ll connect you with a shortlist of the best-fit suppliers with just the technology solution you’re looking for. A CRM system often connects to “call centre software” - somewhat of a misnomer, as nearly every call centre today needs to be equipped to deal with a range of contacts, not just calls. For example, customers are increasingly turning to social media, web chat, and email to interact with an organisation, hence the term “contact centre”, which encompasses all these channels, is now commonplace. 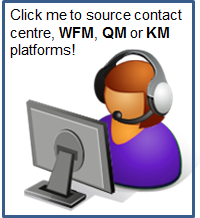 Contact centre software comprises a variety of systems which are designed to improve efficiency, automate tasks, and measure and monitor performance. For example, a knowledge management (KM) system enables agents to access up-to-date information about a product or service easily, reducing the amount of time spent in training, and allowing customer inquiries to be processed more quickly. Workforce Management (WFM) software enables companies to staff in the most efficient manner, reducing “fat” in an operation, and ensuring schedule adherence. Through Quality Monitoring (QM) software, managers can gain valuable insight into individual contact centre agent performance and identify those who need extra coaching. When people talk about contact centre software, they are often referring to a multi-channel system which an agent uses to interact with customers over the phone and through all other media – the system can report on a range of efficiency and customer experience KPIs, by channel. When purchasing call centre software, it's important to clarify whether the vendor’s pricing is based on “named users” or “concurrent users”. This can have a large pricing impact in a 24x7 operation, in particular. •Improve efficiency and reduce costs – this is always music to the finance department’s ears. Demonstrate how, despite growth, you can do more with the same headcount by leveraging technology, thus reducing the average cost to serve a customer. With a product like speech recognition, you can use market data to predict a reduction in calls which require a live agent’s attention. And investment in a mobile app can provide customers with account and service information, as well as ordering capability, when they are on the go, again meaning less calls to the call centre. •Enhance service to customers – upgrading to a robust knowledge management (KM) system which allows the same agents to handle hundreds of call types has massive savings in training costs, wages associated with a reduction in average call handle time, and elimination of many call backs due to first-time resolution – resulting in a much higher level of customer satisfaction. Likewise, investing in a quality monitoring (QM) system allows your operations team to actively spot opportunities for improving the customer experience amongst the agent workforce, and coaching to better outcomes which mean happier customers and repeat business. •Learn more about what customers want – what every marketing, product development and senior executive should want to know more than anything. Knowing what your customers are – and are not – looking for and where your competitors are meeting or failing to meet a market need, is information that is absolutely critical to a business’s success. Yet so few companies are effectively leveraging technology to attain this holy grail. Something as simple as a customer feedback platform, or a more complex speech analytics product, are goldmines of customer insights which can give a company a truly competitive advantage. Big data analytics is now accessible to smaller (20-100 seat) call centres as well, thanks to the advent of analytics-as-a-service. If you'd like personalised assistance with technology purchasing, please contact sales@aboutmatch.co.uk.